When you buy your ribbon of green stuff, do not leave it together in the way you bought it. 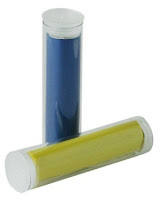 Separate the yellow half from the blue half with a hobby/ xacto knife. Then place each half in a small airtight container of its own. Gladware and Gale Force 9 make small containers that are perfect for this. After they are in their component halves store them in your freezer. Yes you will need to thaw them out when you need to use them, but you will greatly extend the useful life out of your green stuff. If you buy the two tubes of green stuff from Gale Force 9 then take it out of the tubes and put them in some wider mouthed container. You will find after a while the plastic tubes it comes in are difficult to work with. I am a fan of the portable working surface. A piece of plastic card .040” thickness will work just fine. If you cover the plastic card with brown packing tape you will have a surface that green stuff will not adhere to well, which means you can make an item and pull it off your working surface with relative ease when you are done. The speed that green stuff cures at is affected by temperature. The warmer it is the faster it will cure. Cooling it down will slow curing time but the putty becomes stiffer the colder it gets, so it doesn’t balance out. However, speeding up drying time might be exactly what you need. If you can get a toaster oven that you can set the temperature on then you will be in business. At 150 degrees Fahrenheit you can get green stuff to set in 10 minutes. I only recommend the toaster oven on all metal models, or if you are making your green stuff piece separate of the plastic model. When you start to get adventurous and go beyond gap filling and detail repair, you will want to look into brown or grey stuff. It is aluminum epoxy putty, and its primary use is for creating armatures that you will base your green stuff on. Its ability to “self-armature” makes it really good when you are making cloth or banners. Currently the only companies that I have found that sell the stuff are Reaper and Gale Force 9. I am sure there are other companies that resale the stuff, but these are currently the only two I know of. That wraps up my thoughts on green stuff. Do you have any green stuff “pro tips” that I have missed? Tell us about them. Also, keep your eyes peeled for future conversion articles. I will be using many of the techniques that I have discussed.